Johanna Pichlmair was born in Judenburg, Austria, in 1990. 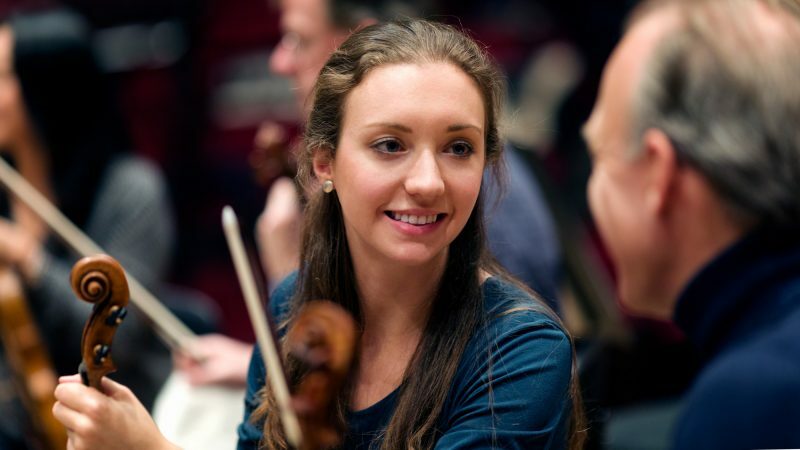 After studying for years with Alexandra Rappitsch in her native town she enrolled at Salzburg’s Mozarteum University in 2008 to study violin with Igor Ozim. One year later she transferred to Hanns Eisler University of Music in Berlin, where she continued her training with Antje Weithaas and later with Feng Ning. Since 2014 her teacher has been Nora Chastain at Berlin University of the Arts. She also received valuable suggestions in master-classes with Mayumi Seiler, Pinchas Zukerman, Lewis Kaplan and Eberhard Feltz. Among her many awards and distinctions are prizes from the Ibolyka-Gyarfas-Competition in Berlin, the Fritz-Kreisler-Competition in Vienna, the competition “Pacem in Terris” in Bayreuth as well as at the International Bodensee Music Competition. In July 2018, she received the 1st prize at the Ysaye International Music Competition in Liège. She has held scholarships from the Villa Musica Foundation (Rhineland-Palatinate), the Ottilie Selbach-Redslob Foundation and the Deutsche Stiftung Musikleben and was a member of the Herbert von Karajan Academy of the Berlin Philharmonic (2014-16). Her solo appearances and recitals have already taken her to many European countries as well as Canada and the United States. She has made guest appearances at the Schleswig-Holstein Festival, the Heidelberg Spring and the Ludwigsburg Palace Festival and was a featured soloist with the Munich Radio Orchestra, the Nuremberg SO, the Southwest Chamber Orchestra (Pforzheim), the Vogtland Philharmonic and the Graz Philharmonic. In 2015 she won a scholarship from the German Music Competition and was chosen for the nationwide Young Artists Concerts in the 2015-16 and 2016-17 seasons, where she made many appearances with the Trio Pascal and other duet and trio formats. The Deutsche Stifung Musikleben provides Johanna Pichlmair with a violin by Joseph filius Andreae Guarneri, Cremona 1730, from the German Fund for Musical Intruments. She has been a member of the Bavarian Radio Symphony Orchestra since september 2017.